New ARRIVALS and WEBSITE - Just So French! I remember with fondness the weekend jaunts to France and other parts of Europe when I lived in London. Back home in New Zealand I am fortunate to still pursue my passion for antiques through the establishment of European Antiques. Fourteen years on and I still get so excited when new shipments arrive. 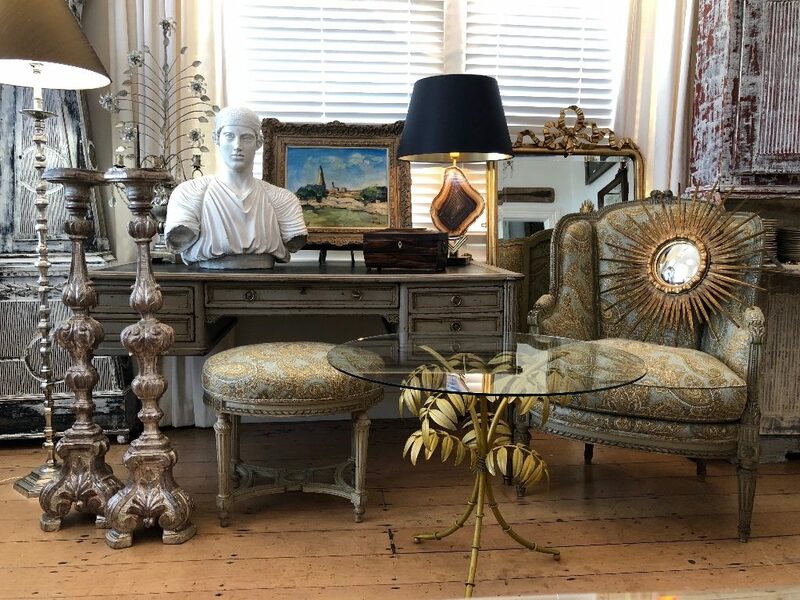 European Antiques is the result of a lifelong pursuit that sees me scouring Europe each year to offer the beautiful, the rare and the collectible; all of which are available for sale via my recently revamped website. 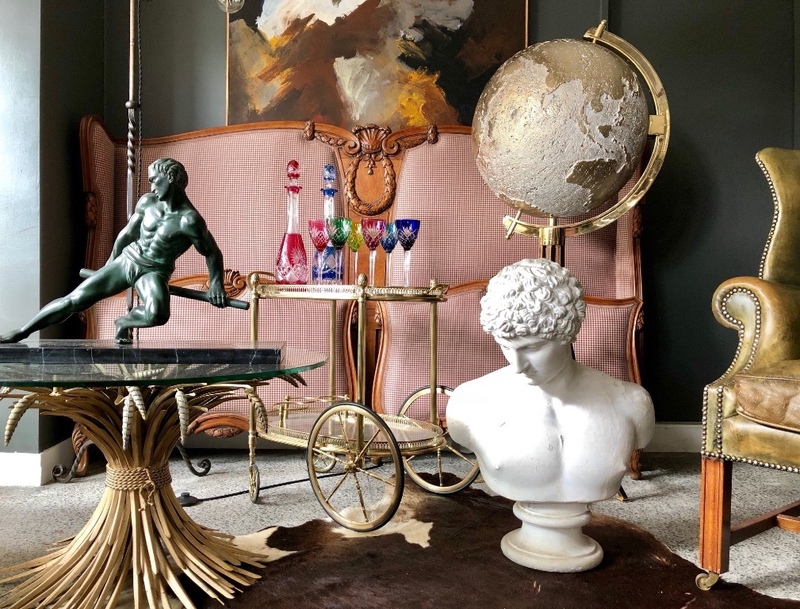 INSTAGRAM feed so you can join 46,000 other followers on all things inspirational from Interior Design, French Chateaus, Gardens, and of course Antiques. 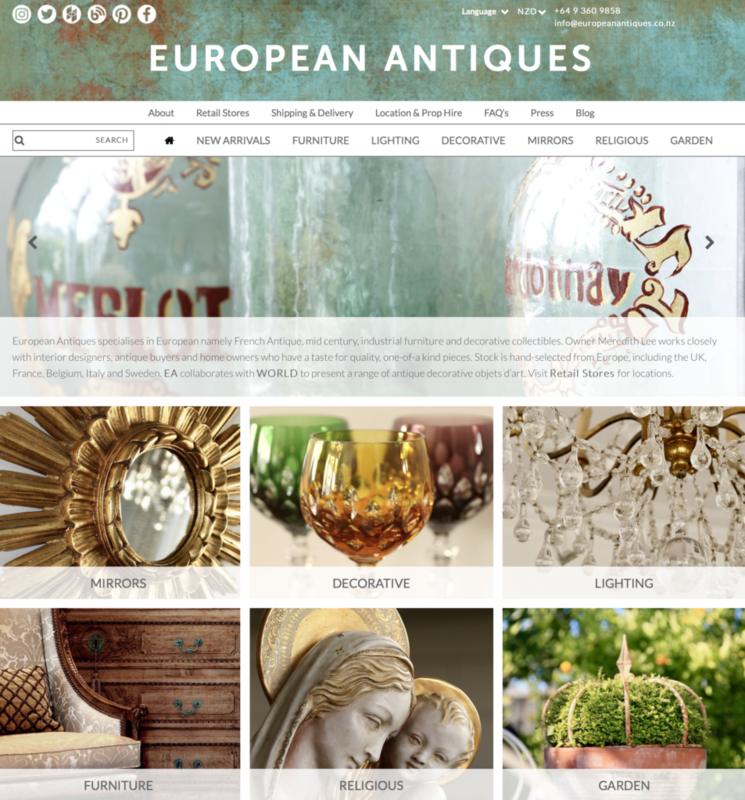 I trust you will enjoy browsing and would welcome any feedback to [email protected] so I can continue to improve the European Antiques web and product experience. Val St Lambert is a Belgian crystal glassware manufacturer founded in 1826 and based in Seraing, Belgium. It has the Royal Warrant of King Albert II and is still in production today. How is the coloured crystal made? Most coloured pieces have two layers of glass, called “cased glass’. The two layers are fused together at the glass factory. They are then cut through from the outer layer of coloured glass to expose the clear layer, which gives the piece that nice contrast. Cased “cut to clear” glass is more difficult to make and to cut, also more time consuming, and therefore more expensive. There are different metal oxides used to colour glass. For example, real gold is used to create “gold ruby,” cobalt for blue and iron oxide for green. Click here to VIEW the antique selection of Val St Lambert Crystal available under Decorative | Crystal and Glass. This section will be updated as more crystal is released for sale. Below is a sample of what you can expect to find. A large and impressive late nineteenth century French silver gilt Radiate-monstrance with champlevé enamelled medallions rising from a quatrefoil base. It is hallmarked with the French 19th century silver hallmark (Minerva) and the makers mark for Chevron Freres (Brothers) the Parisian goldsmiths. The cross at the top of the monstrance is finished with an enamel of the cross. The central lunula containing a blessed sacrament is surrounded by a circle of large diamanté effect stones and high-quality champlevé enamel. Contained within the central hand painted enamel quatrefoil are four medallions depicting the four evangelists – Mathew, Mark, Luke and John. A further layer of filigree work surrounds the quatrefoil incorporating grapes and foliage. The circular stem is finished with fine engraving work and faux ruby cabochons on the decorative knop flanking four enamels of the Holy Arch Angel. The quatrefoil base contains four further champlevé enamel medallions depicting four Saints. The monstrance is in original used condition (unpolished) which I like, but she could be polished if you prefer more bling! (. 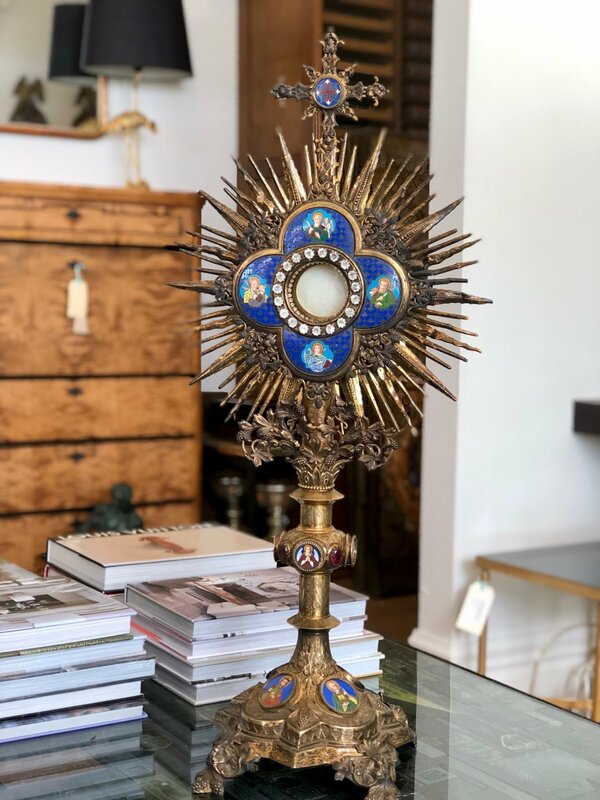 In 14 years of trading I have sold a lot of religious artefacts and this is the most wonderful monstrance I have been able to offer for sale and I know I am unlikely to get anything like this again. It is a work of art. I have a copy of the last purchasers receipt from 21st April, 1986 for 200,000 Belgian francs which historically equates to around $8k in NZ dollars. 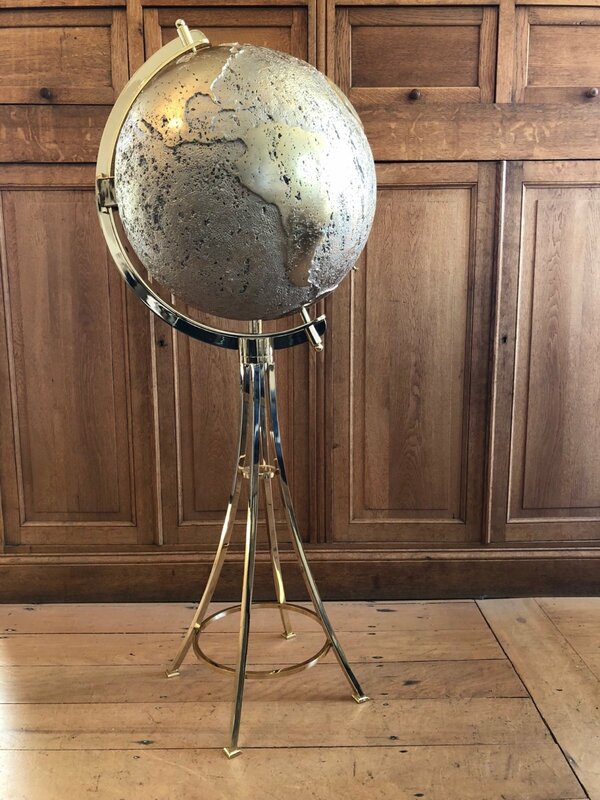 Impressive Vidal Grau Bar c.1970 in the form of a world Globe sitting on a Brass pyramid Base. The resin globe opens to reveal a brass interior for storing up to 15 liquor bottles and associated glasses. The central gallery rotates for easy access to your favourite tipple! The origins of Vidal Grau go back to 1953, when it was known as SOYMA, in the city of Valencia. Their furniture range was based on contemporary design using traditional quality materials such as wood, metal, glass, marble and other innovative elements such as moulded resin mixtures. This statement piece is in extraordinary condition and as the company is no longer in business it makes this piece even more desirable. Signed with molded manufacturer’s mark to underside: [Vidal Grau Valencia-Espana]. 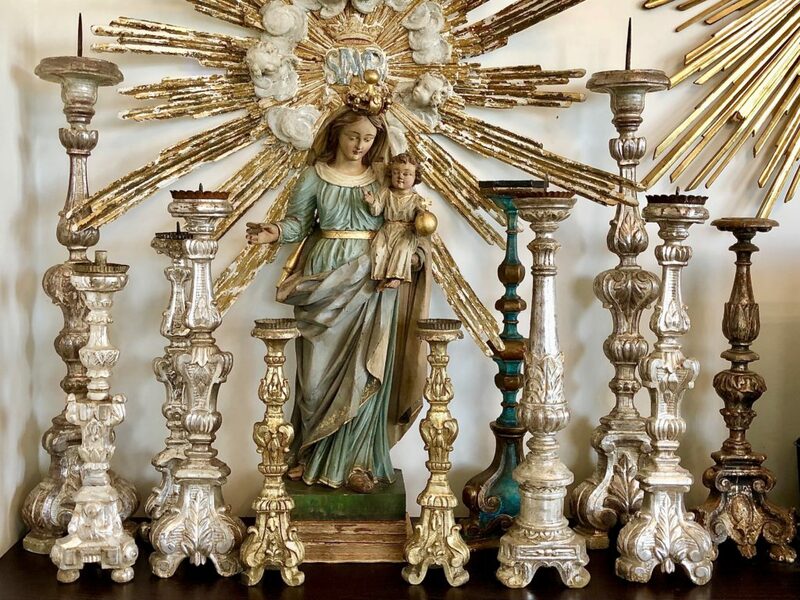 These are just some highlights of what is available through European Antiques. I ship worldwide and encourage enquiries from wherever you are.